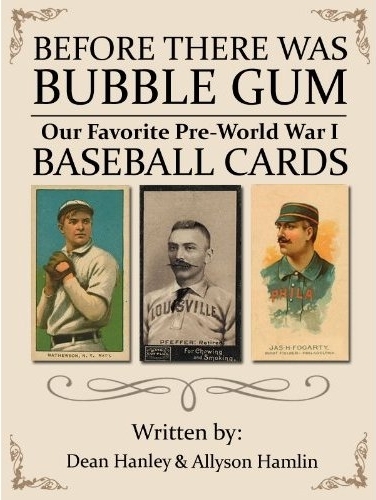 CINCINNATI, Ohio (April 20, 2011) – After six months of hard work, Dean Hanley of DeansCards.com, has published his very first eBook, chronicling the history of the Pre World War I baseball cards. With the help of co-author Allyson Hamlin, a Dean’s Cards employee who focuses the majority of her attention on these early cards every day, the duo has published a 50 page informational read on some of baseball’s earliest cards. While Dean has been considered an “expert” within the vintage card field for several years now because of his numerous published articles, this is Allyson’s first major publication. She began working for Hanley when she was fifteen years old, and though she went away for college, she continued to work for him on her various breaks. She is now 23 years old, and a graduate of Indiana University. When she first went to work for Dean 8 years ago, Allyson simply sorted and sleeved cards, and pulled various orders in Deans basement office space. In recent years, Allyson has grown to love various aspects of the hobby, and has devoted much of her time researching the many Pre-World War I vintage sets out there. Only six short months ago, Allyson and Dean began compiling the book. “There’s not a lot of information out there. All of the Pre-War players are deceased, as are the original buyers, leaving us with very few primary sources”, says Allyson. With that said, Allyson really had to scour the web and piece together a lot of tid-bits of information when writing this book. “I found a few pictures of packaging, I would zoom in on the picture to see who manufactured the package, and then researched the manufacturer. It was a lot of detective work”. Initially, Allyson conducted this research in order to write short blog articles on the various Pre-War sets. When Dean saw how much work she had put into her research, he came to the conclusion that it would be wasteful not turn this valuable information into some sort of book that other collectors and baseball enthusiasts would enjoy. “Virtually no one knows about several of the sets discussed in this book. There’s just not much information out here on these early sets” says Hanley. Before there was Bubble Gum: Our favorite Pre-World War I Baseball Cards discusses a variety of early cards, ranging from tobacco cards, to caramel cards, to cards issued with clothing, and everything in-between. The book is divided into sections, and each section is devoted to focusing on one type of card. The T-Card section for example, gives an overview of the T-Card industry as a whole, and then is further broken down by chapters. Each chapter contains information on one specific set of cards, and features numerous color pictures of the cards being discussed. The T206 chapter for example, discusses the various rare and common card backs found on the American Tobacco Company’s famed white-border cards. Both Dean and Allyson put a lot of hard work into publishing this eBook, as well as the rest of the Dean’s Cards staff who edited the book and helped with the formatting. To learn more about the eBook, click here. Dean on the Fox19 Morning News!